This is a sponsored post brought to you by Southern Kitchen. All opinions are my own. 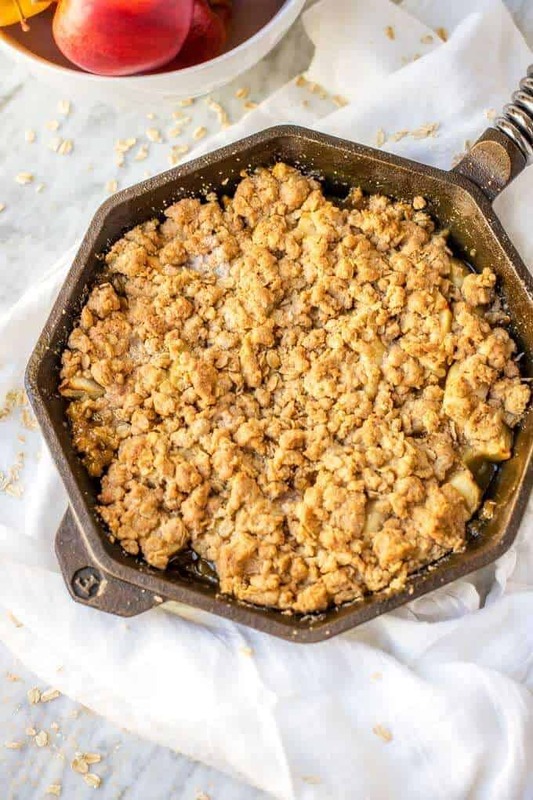 This Gluten Free Apple Crisp Recipe with oats is an easy and healthy(ish) dessert option. Make it in a cast iron skillet for easy cleanup. I grew up in the South, and many of my earliest memories happened in the kitchen. I can remember being in the kitchen with my Mom from the time I was Skye’s age. Perhaps my most vivid memories, where those in my Grandmother’s kitchen. Oh, she could cook. She lived her entire life in a tiny town in middle Georgia. Eating out wasn’t something they did. She cooked three meals a day, and I don’t recall her ever complaining about it. The back door to the house opened into her kitchen, and friends and family frequently used that door to come and go. Her brother and my Great-Grandmother also lived in the same tiny town, so friends and family were always stopping by. There was more than just food made in that kitchen. It was such a welcoming kitchen where traditions were passed down, and our family strengthened. Today I’ve got a Gluten Free Apple Crisp for you, that is simple Southern fare that even a beginning cook can master. You see that gorgeous skillet? It came from Southern Kitchen, which is a fabulous website to shop for everything you need to make your kitchen functional and beautiful. Southern Kitchen is all about delivering the very best in eating, drinking and entertaining! They offer quality products that celebrate those of us who are redefining what it means to “cook Southern.” Southern Kitchen is all about the belief that, in the South, more than just food is created in the kitchen. Having lived this first hand, I get it completely. What happens in the kitchen reflects both the welcoming spirit of the South and the storied history of the region. Shop Southern Kitchen with this Special Reader Savings! Right now, you can save $10 off your first purchase over $50 at Southern Kitchen. Use coupon code WELCOME10. SHOP NOW. Make sure you check out Southern Kitchen’s expansive recipe collection. They are continuously testing, improving and growing it! Do you have a favorite family recipe you would like to share? Submit your own recipe to Southern Kitchen. In a large bowl, toss together apples, lemon juice, and sweetener. Melt butter in a large oven-safe skillet over medium heat. Add apples and cook for 5 minutes, stirring occasionally. Remove from heat. Meanwhile, make the topping by combining flour, oats, sugar, and salt in a large bowl. Add the butter to the bowl and then mix until crumbly, using clean hands if necessary. Scatter the topping over the apples, and bake for 35 to 40 minutes. Let cool slightly before serving. Want to make an apple crisp with no flour? Substitute almond meal for the gluten-free flour. For a sugar-free apple crisp, use Swerve sweetener. 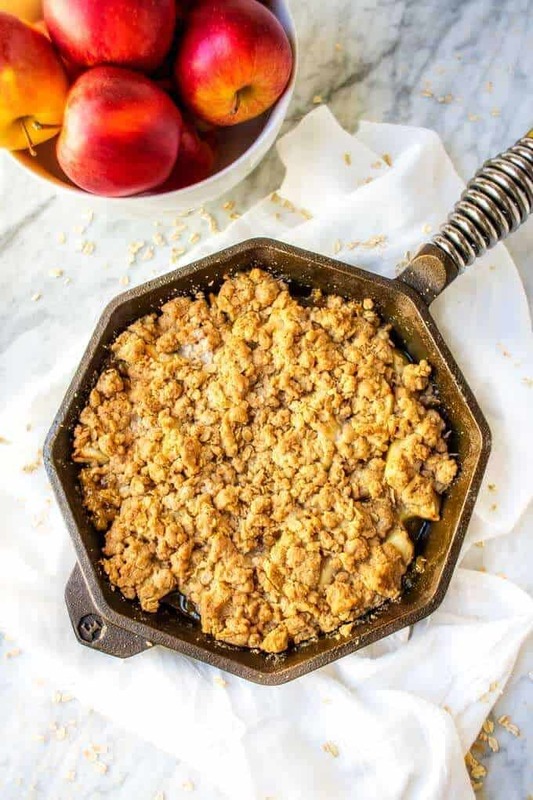 That skillet is lovely and perfect for your apple crisp. I love how easy clean-up is when using a cast iron skillet. Your gluten-free apple crisp looks amazingly delicious! Your grandmother s kitchen sounds alot like my grandmother’s kitchen! Food seemed to be her life after her children and us grandchildren. 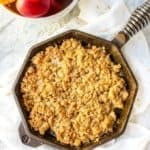 This gluten free apple crisp sounds amazing and I having been looking for something to take to a special person and she is gluten intolerant. There’s nothing better than making dishes that remind you of your childhood! 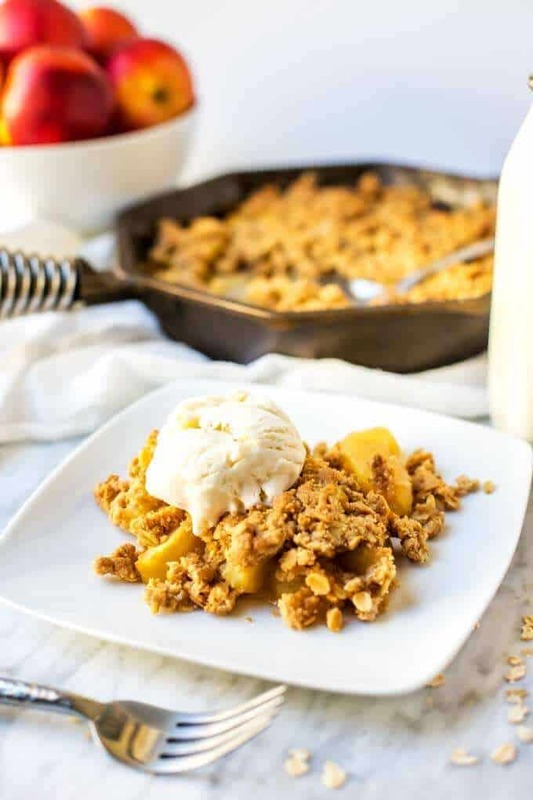 I think this apple crisp is a must try and I love that it’s gluten free! THis is the perfect time of year for an apple crisp. Heck, any time of year is time for an apple crisp. Add ice cream and it’s even better. Thanks for sharing. I try to eat GF! This recipe is perfect for me! This gluten-free apple crisp looks so delicious and really tempting. I really love apple and I think this recipe will satisfy my craving. I will definitely try to make this. I love apple crisps so much. They are delicious any time of year, but especially during the holidays. Love this gluten free option so everyone can enjoy it! I am glad there is a gluten free option for apple crisps. I sometimes have guests over who are on special diets and this wold be perfect to make for them. Thanks for sharing the recipe. Apple crisp is one of my favorite desserts ever. I’ve never tried it gluten-free though! Looks amazing. Great idea for a recipe. I like apples and the fact that it is gluten free is great. I usually have gluten, but thinking about going back to no gluten and this would be a perfect dessert. This looks so delicious! My kids would ADORE this dessert!